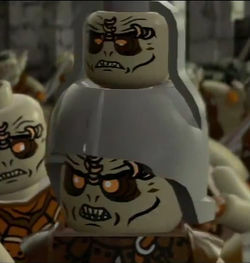 Guritz is a character that appears in LEGO The Lord of the Rings: The Video Game. Guritz was an orc captain who served Gothmog during the Battle of the Pelennor Fields. He wore a helmet with a skull impaled on a spike, and the only weapon he was seen wielding is a two-handed scythe. He fled the charging Rohirrim and went with a band of orcs to the docks to mock the late-arriving pirates aboard the Corsairs' ships. He was startled when Aragorn, Legolas, Gimli, and the first wave of the Army of the Dead jumped out of the Corsairs' ships and attacked him and the other orcs. He was killed by Gimli. This page was last edited on 9 January 2016, at 23:04.